Remember when you and your spouse were dating? All the fun and romance that you thought would never end. Fast forward a bit and now the only things that never end are laundry, chauffeuring the kids around, and work. What happened there? Life got in the way. It is time to get “life” out of the way, at least for a few hours a month anyway. In our simple opinion, a successful family life needs a loving marriage as the cornerstone. One great way to “keep the heat” is to date your spouse. Stop reading this right now! Go pickup your family calendar now and write in date nights for the rest of the year on the calendar. No activity is allowed to trump a date night! Below are some fun date ideas (hey, it may have been a while since you dated and why not have a dating cheat sheet!). And remember, if the grass looks greener on the other side, it is time to water your grass. Play a game of pool. Put the kids in bed early and enjoy a candle light dinner…in your house. If you are worried about your cooking skills, get some take out and put it on your plates (we won’t tell!). Zoom zoom – go Go-Cart racing. Play some poker. Make a meal together. Run a race together. Send the kids out and you stay home together. Go dancing. Find a local theater, museum, concert, . . .
Go see a Drive-In movie together. Go stargazing. Take a class together and learn something new. Go window shopping trying on & modeling clothes for each other, then put them back on the rack. Share an icecream sundae. Campfire, bottle of wine, . . .
Take a hike and picnic at a park. Go on a scavenger hunt together (taking pictures at each stop,) or send your spouse on one that ends where you are. Go test drive a fancy car together. Take a walk around your town. Dates can be fancy or free. The important thing is that you take the time and effort to have them. build healthier marriages and families. 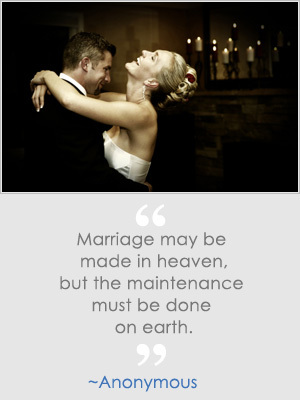 Turn a good marriage into a great marriage. ©2009 How Do You Mate Socks.com. All Rights Reserved.